Furthermore, the major societal and scientific challenges facing humanity in this digital age are profoundly global in character, requiring the participation of researchers from all countries and disciplines. The data revolution is also a major source of the scientific opportunities to address these issues but to realise these potentials the frontiers of science, data analysis and stewardship must be advanced. Likewise, the data revolution must be inclusive, benefitting all, and harnessing all energies: no parts of the world and no disciplines should be left behind. Like its predecessor, IDW 2018 will bring together data scientists, researchers from all disciplines, industry leaders, entrepreneurs, policy makers and data stewards. All areas of research are in scope, including the social sciences, humanities, and business and management sciences. Similarly, the applications of data outside of research will also be considered. The event will be a rich week of science and data, featuring world renowned keynote speakers, plenary panels and discussions, the presentation of high quality research and practical working sessions for international collaborations. 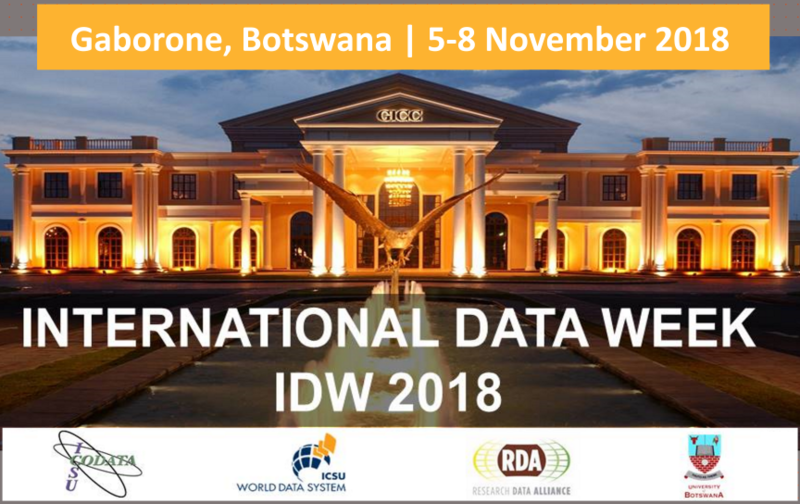 IDW 2018 combines the 12th RDA Plenary Meeting, the biannual meeting of the research data community, and SciDataCon 2018, the scientific conference addressing the frontiers of data in research. To a greater degree than at IDW 2016 in Denver, Colorado, the events will be integrated, such that each day will feature an inspiring and engaging range of activities.